We're thrilled to announce that our other major project (other than GeriPal, that is) has undergone a radical transformation. ePrognosis 2.0 is here! The new site features an easier to use modern interface based on our cancer screening website, now incorporated throughout. The major new innovation is a whole new section, ePrognosis: Communication. This section features teaching videos with expert communicators: Sei Lee, Mara Schonberg, and Eric Widera. The major focus are discussions around prognosis, as viewed through 3 common clinical scenarios: cancer screening, setting diabetes targets, and goals of care/code status for people with a short prognosis. We have detailed take home teaching points and words to use for key skills, such as how to explain lag time to benefit, addressing uncertainty, and discussing tradeoffs. 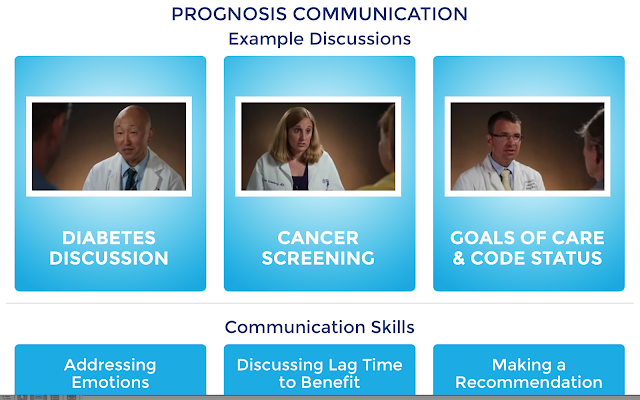 Why did we add the ePrognosis: Communication section? We've heard time and time again from practicing clinicians that they love ePrognosis as a tool. But the rubber meets the rode in that clinic room and at the bedside - and most practicing clinicians don't know how to talk to patients about prognosis. The main thing to take away from these videos is a discussion. We've used them to get our trainees talking about how they might do things similarly or differently, to practice, and to out these skills themselves. Please try out the new site. Tell us what you think in the comments. Spread the word! We are very grateful to the John A Hartford Foundation and the American Federation for Aging Research for their support for the ePrognosis Communication section.